iPrints are the perfect solution if you want to make your existing gloves touchscreen compatible. You simply remove one of the iPrints from it's packaging, peel off the protective backing, then press the sticky side of the iPrint onto the finger tip of any glove you like, instantly transforming them into high-tech touchscreen friendly gloves. It really is as quick and simple as that. 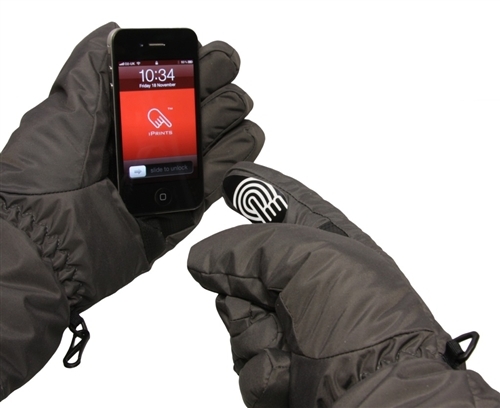 You only need to use one iPrint to make your favourite pair of gloves work with any capacitive touchscreen device, but this pack includes a spare. These do work but they are not flexible enough to be really effective. Also it's tricky to cut them down to the right size and shape. But they are ok for answering your phone and maybe even a short text or scrolling through a site, facebook etc.